Please see also the guidance on learning the pronominal prefixes. m=minimal, ua=unit augmented, a=augmented. 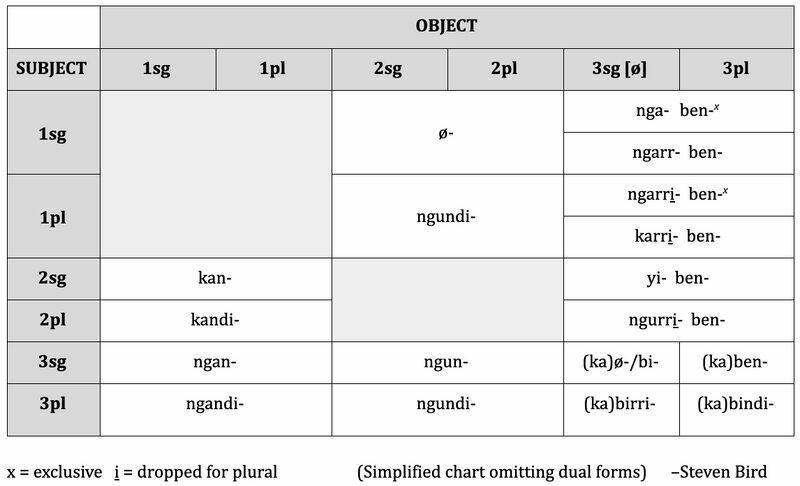 sg=singular, du=dual, pl=plural. 1m=I, 1ua=I+1 (I and one more, excluding hearer), 1a=we (excluding hearer). 12m=I+you, 12ua=I+you+1 (I and you and one more) 12a=we (including hearer). This page was last edited on 10 September 2018, at 21:38.